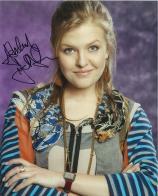 Ashley Jensen (born 11 August 1969 in Annan, Dumfries and Galloway) is a Scottish actress. She was nominated for an Emmy for her role on the television series Extras, on which she appeared from 2005–2007. She was also a cast member of the ABC show Ugly Betty and the CBS sitcom Accidentally on Purpose.